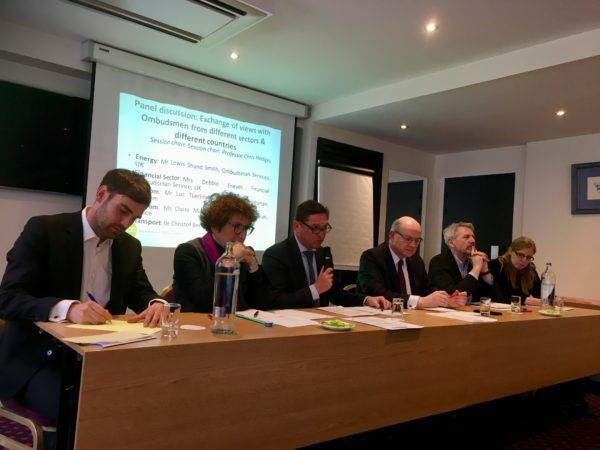 On the 22nd of February, ombudsmen from different sectors, academics and stakeholder representatives from consumer organisations, regulators and businesses gathered for a round table on the role of ombudsmen in critical economic sectors and shared their expectations regarding the upcoming New Deal for Consumers, to be presented by the European Commission in April 2018. This event followed the historic vote by the European Parliament ITRE Committee on the Commission proposals to reform the electricity market out to 2030. This vote is acknowledging the role of ombudsmen and their crucial role in setting up a fair market for energy consumers. The European Parliament also makes mandatory for all involved traders and parties, energy service companies, aggregators and all providers of contracts with energy components, including bundled offers and local energy communities, to engage in out-of-court dispute resolution and inform their customers of their rights. The roundtable allowed participants to reflect on the specific missions of ombudsmen compared to other forms of alternative dispute resolution (ADR). Their work goes beyond consumer dispute resolution, complaint handling and providing redress since ombudsmen have also a mission of advice and support to consumers, companies, regulators and policy-makers. Their legitimacy stems from the aggregation of data and insights on the disputes they handle. The gaze of ombudsmen goes farther than the consumers’ individual stories, and allows market players to see consumers as citizens with rights. The work of ombudsmen has a positive impact on all consumers, even those who do not complain. Market players get to see the big picture and receive the right tool to drive better behaviour. The work of ombudsmen also serves the businesses by identifying shortages and the areas where adjustment is needed. Ombudsmen provide traders with guidance to improve their market practices. In all sectors, thanks to their independence and impartiality, ombudsmen are the key partners of regulators and policy-makers and engage parties in a virtuous circle that benefits all. However, stakeholders noted that the lack of awareness of the existence of the schemes by many consumers, and more worryingly, the insufficient compliance from certain providers, represents a threat to the culture of trust that ombudsmen are aiming to build. Hence, participants recognised that close cooperation among the different countries and sectors is critical for delivering the best outcomes for consumers and the market, and that technology can be a good enabler. This goes in line with the recent proposal of the PEER initiative (Partnership for the Enforcement of European Rights ) led by Europe’s energy regulators, to improve the enforcement of the European consumers’ rights through enhanced inter-authority cooperation at EU level. It appears therefore critical that regulators and policy-makers, including the European Commission in the upcoming New Deal for Consumers, commit to reinforce the existing models and take actions to stimulate awareness-raising in order to create a culture of compliance and enforcement of consumer rights. In particular, the upcoming New Deal should carefully look at the areas where it is not mandatory to engage with ADR or ombudsmen and support the development of the highest standards of alternative dispute resolution.